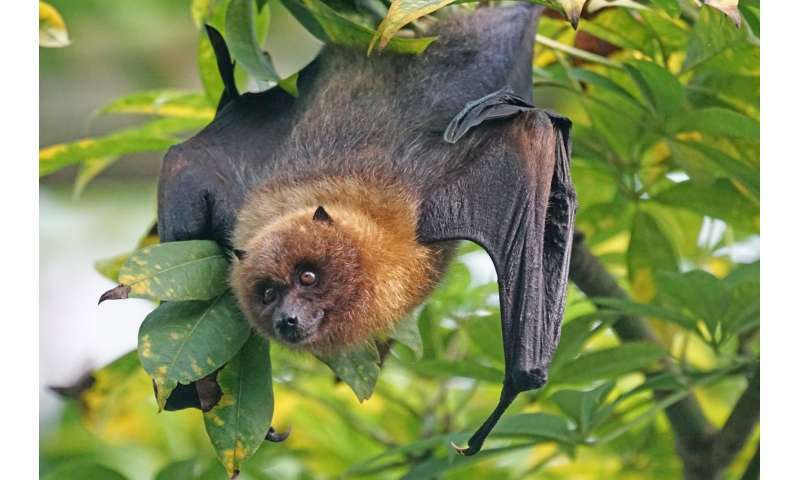 A large fruit-eating bat native to Mauritius is the subject of controversy over the announcement of a major cull to protect the Indian island's fruit crops, despite a lack of evidence as to the extent of damage directly attributed to the endangered species. An international team of researchers, including the University of Bristol, that monitored the damage directly caused by the Mauritian flying fox to commercial fruit has found the bat is responsible for only some, and could be managed effectively without the need to cull.The study is published in the journal Oryx. As a species of bat largely restricted to Mauritius, the Mauritian flying fox has an important role in helping to pollinate forest canopies and disperse the seeds of large trees in the island's declining forests. However, the bats also feed on cultivated fruit such as mango and lychee and are perceived to cause large economic losses to commercial fruit farmers (annual estimates equate to five million US dollars). Until now, information on the scale of damage directly linked to the bats and the efficacy of mitigation interventions has been lacking. An international research team, involving Ryszard Oleksy from Ecosystem Restoration Alliance Indian Ocean , the Mauritian Wildlife Foundation and researchers from the Bristol's School of Biological Sciences, monitored damage in commercial fruit farms. Their findings showed that while bats caused damage to a quarter of all monitored fruits overall, with more damage on taller trees (>6 m), significant losses were attributed to birds and by fruit fall. By experimentally covering trees with nets, the team were able to prove that fruit damage by bats could be dramatically reduced, even if nets are placed over trees without using a frame. The study recommends that farmers can reduce fruit losses by pruning trees to reduce their height, harvesting fruit before it is too ripe for selling, and using nets to reduce fruit loss by bats (the Mauritian government subsidises the costs of nets by 50-75 per cent at orchards and for backyard growers respectively), preventing the need for culling. The species was uplisted this year as 'Endangered' by the International Union for the Conservation of Nature in its Red List (the barometer of life) this year. It is estimated that approximately half the total population of this species of bat may have been culled in 2015-2016, and 5,000 to 6,000 bats are killed illegally each year. Given the magnitude of the population decline, the slow reproductive rate of the bats, their vulnerability to cyclones, deforestation, current estimates show 62,500 bats remained alive in 2016.Last month's announcement by the Mauritian Government of a further 20 per cent cull of the Mauritian flying fox population could prove critical to the existence of the species. Ryszard Oleksy, the study's lead researcher and a former Bristol Ph.D. student, said: "Further culling is clearly unnecessary, and hopefully the vital ecological roles played by these remarkable and endangered animals can be encouraged and enhanced in the future." Gareth Jones, Professor of Biological Sciences from Bristol's School of Biological Sciences and an expert in the ecology and behaviour of bats, added: "It seems bizarre that a species that plays crucial ecological roles that is found nowhere else in the world should be culled to such a huge extent in the absence of reliable evidence about how much damage it causes and whether culling is an effective form of control. We hope these findings help provide the evidence to show more effective interventions for safeguarding fruit crops." Mauritius is not an "Indian island...", but an independent nation in the Indian Ocean.